As a company we are currently celebrating the completion of a multi-million dollar redevelopment. We are now the proud owners of a 1200m factory, housing state-of-the-art painting, blasting and plasma cutting facilities. This enables us to perform large, small and complex tasks, providing the ultimate in cost-efficiency and precision to our clients in NSW. 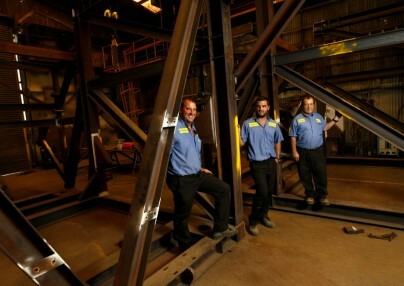 In addition to our long-established expertise in the mining and energy sectors, we have also become a valued steel fabrication supplier to the water treatment and materials handling industries. 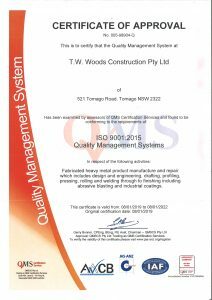 Founded by Tom Woods in 1963, and owned and operated in NSW by brothers Tom and Glenn Woods, we place a high value on staff training and retention. We have 10 staff members (in a workforce of 40) with more than 10-20 years experience working in the industry. Passing on the torch for dedicated steel fabrication is Tom’s son Jamie, who is the third generation of the Woods family to join the company. With over 4500m2 of purpose-built, fully equipped workshop space at our headquarters in Tomago NSW, we are on the of the largest heavy engineering and steel fabrication companies in Eastern Australia. We have the ability to provide a complete, in-house service to our customers. This includes the project management, design, manufacture, blast, paint, assemble and delivery of the finished product. At TW Woods we have continued staff loyalty of over 50 years, exceptional broad-ranging skills and vast amounts of knowledge and experience in our industry. T.W. Woods Construction in NSW is highly respected by its customers and peers, for our level of commitment and traditional values when it comes to service and quality. With more than 50 years established as the expert in heavy engineering and steel fabrication, we have proudly had numerous industry leaders among our repeat clients. In our time we have consistently pioneered the development of practical solutions to meet the unique demands of local and international engineering and manufacturing clients.